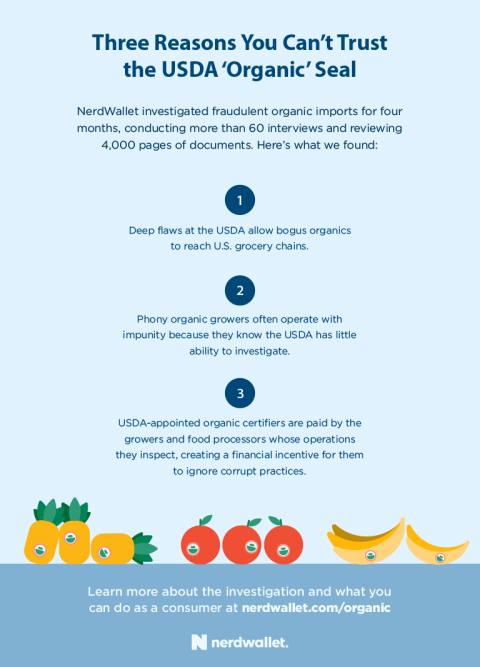 The U.S. Department of Agriculture fails at regulation of organic food as fraudulent products overwhelm the agency’s conflicted, compromised system, a NerdWallet investigation has found. The USDA’s National Organic Program has not kept up with the explosive growth of organic food production and sales — either in staffing or enforcement, NerdWallet found. Since the program began two decades ago, organic food sales in the U.S. have soared to a record $43 billion a year and currently account for 5% of the U.S. food market, according to the Organic Trade Association. A NerdWallet investigation found flaws in the way the USDA certifies organic food. The system today enables high-dollar fraud, as swindlers exploit high premiums charged by honest players for the risks, expense and hard work of producing genuine organics. The USDA’s failings undermine authentic producers and tarnish the agency’s organic seal, jeopardizing its promise as an emblem of trust. The USDA creates conflicts of interest by allowing cozy relationships between growers/processors and the companies that certify their operations as organic. The USDA accredits 80 certifiers worldwide. However, those certifiers are paid not by the agency, but by the growers and processors they certify. And the growers and processors get to choose their certifiers from the list. It does not require certifiers to be neutral arbiters. Instead, certifiers are allowed to advocate on behalf of the companies they certify, harass critics and lobby for changes in rules governing the organics industry. The agency often asks and trusts certifiers to look into alleged violations by their customers, instead of investigating independently. It fails to investigate allegations that its certifiers have engaged in fraud or collusion. The USDA badly understaffs its National Organic Program. To investigate certification irregularities and fraud, the division has just five compliance officers, one for every $9 billion in certified-organic food sales, says Mathews, the former agency official. He estimated that compliance officers had a backlog of as many as 500 cases; they closed hundreds of them this year in a drive to reduce the backlog. It hires compliance officers who lack law enforcement and investigative experience. The director of organic compliance and enforcement is a former USDA policy advisor, marketing specialist and grants manager with a background in university administration. Enforcement actions are cloaked in secrecy. Watchdog organizations, commercial ventures and the media must file public-records requests to get basic information concerning investigations and outcomes. One organization, the Cornucopia Institute, has filed 10 lawsuits alleging illegal delays, overuse of exemptions to freedom of information rules requiring release of public records, and other tactics. The USDA caps penalties at $11,000 per violation, a minuscule sum compared with the multimillion-dollar profits a dishonest producer gets from selling a single ship full of conventionally grown produce as organic. It rarely goes to court and instead often settles fines for pennies on the dollar in unannounced agreements, even after proving willful violations. The agency buries its form for reporting allegations concerning certifiers on an obscure website page and imposes restrictive requirements on filing complaints. It doesn’t require importers to produce organic certificates for each incoming shipping container. By contrast, in the European Union, authorities are switching to electronic certification documents at borders to track shipments and prevent forgery. It doesn’t require certification of importers, traders or brokers and fails to create a chain of custody from farms to stores, as the EU does. Importers can accept forged certificates, passing along fake organics using paperwork from companies that didn’t produce the food. It coordinates poorly with other agencies. The USDA Inspector General reported last year that U.S. Customs officials order some organic imports to be fumigated for insects, using chemicals not approved by the National Organic Program, but then return the food to the organic distribution channel. The agency lacks access to a Customs database and therefore the ability to track or intercept incoming ships from abroad, let alone from regions known for fraud. Massive shiploads of falsely labeled organic corn and soybeans from known fraud centers have depressed prices, causing U.S. growers to lose nearly $250 million in sales in two years, says John Bobbe, executive director of Ofarm, a group of U.S. organic grain and livestock producers. It fails to focus on vulnerable points in the supply chain, such as by performing unannounced inspections, chemical testing and checks to ensure that purchases of organic supplies match amounts of products sold. It fumbles coordination with certifiers’ foreign offices, lacking contacts abroad. The agency touts a faulty online database. Presented as a comprehensive list of businesses and certifiers, the Organic Integrity Database is riddled with errors and omissions that bedevil agency officers as well as the public. A review of the list found that various names of companies, suspensions and violations were missing. It refuses to explain its organic program to the media or publicly address fraud allegations. NerdWallet was not allowed to interview agency employees despite repeated requests to its public information office over three months. The agency’s accredited certifiers were even less responsive.